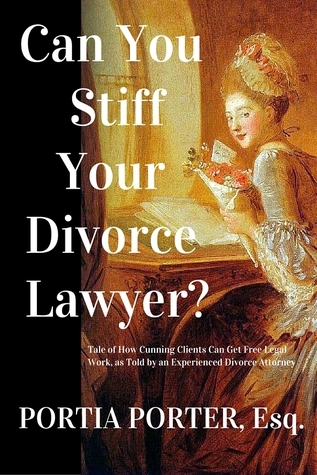 Can You Stiff Your Divorce Lawyer? by Portia Porter, Esq. – Books, Books and More Books! Can You Stiff Your Divorce Lawyer? by Portia Porter, Esq. Given the title one might think this is a self-help book for the cheapskate looking to get a divorce without spending a dime. However it is more about what it is like to start your own practice and avoid getting ripped off by clients and the legal system. Part Fiction, part inside look at our judicial system and a lot of tongue in cheek hilarity! Having spent most of my life surrounded by divorce attorneys for one reason or another, I laughed so hard that I had to call a few paralegals just to read them spots. “But your Honor, we have the fax logs.” Used that one more than once. I had no idea there was a legal comedy genre, but there is and this book fits nicely in that category. The judicial system in small towns is probably not that different from big cities, it’s just more likely that in a smaller town everyone knows everyone and things have been done a certain way for a long time. When you are the new lawyer on the block, it is hard. Neither clients nor judges come with little hashtags over their heads letting us know how honorable their intentions are. Wouldn’t it be lovely if they did? There is nothing I like better than to be entertained and learn something along the way. And this book has hit every mark with me. Whether you are a law student, a lawyer or think you may be in need of one some day this is your book. If you want a good laugh, this is your book. i am looking forward to more from Ms. Porter! If you have a divorce-related question that you are afraid to own up to, Portia is the one you should ask. Portia lives in Ducklingburg, South Duck. You can follow her on Amazon or Goodreads. I still say: who knew there was such a thing as legal comedy? Legal comedy? And here I was looking for comic moments in between the cases I have to read daily as a law student. Thanks for the review! Definitely will be checking this book out soon. Oh yes! Portia is entertaining and you will learn what not to do as a new lawyer! Congratulations on that! Stay strong, ilamisa! Law school is the worst part. After that, it gets easier.